I am crazy 4 challenges!!! I loved this sketch. 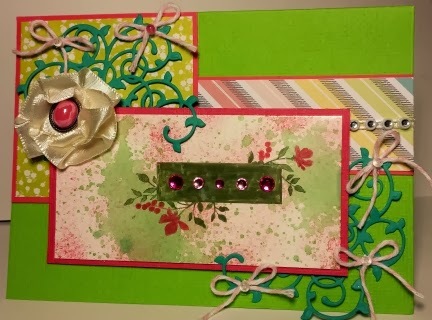 So fun and I recently purchased a Grand Calibur machine and some new dies and embossing folders. The flourishes on my card are one of the "free" dies that came with my purchase. It's a tree. I just poked the trunks up underneath my panels, added some bows and seed beads and I'm lovin' it! I sponged some SU Strawberry Slush ink and spritzed with some Old Olive ink mixed with alcohol, and Champagne Mist. I used my markers to dab ink onto my stamp and then huffed and stamped. If you enjoy challenges or sketches or both, head on over to Crazy 4 Challenges.